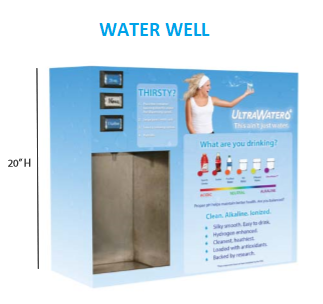 Commerical water ionizers are for all kinds of businesses and organizations! Give Each Customer the Exact Water They Want! Do you have a store front, health club, sport club, exercise club, store, restaurant, doctor's office, chiropractor's office or other location where you've wanted to offer your customers the very best quality of water around? If you have been looking for a restaurant quality, fast-flowing, commercial water ionizer, you have come to the right place! Alkaline Water Plus offers you the equipment to produce hundreds on gallons, per day, of 9.5 PH water (or any pH value you specify). These are the only commercial water ionizers with US certification. If anyone else tells you they have certified commercial water ionizers it may very well be that they aren't telling you the truth, or that the equipment is certified in China or something. In the US the only organization that certifies water dispensing equipment is NAMA (see below about NAMA). if you have worked hard to build your business you will understand how important it is to ensure you use properly certified equipment. Your customers will appreciate this too. Our commercial water ionizers are the highest quality you can get anywhere in the world; they are made right here in the USA; they are extremely economical (see below); and they are fully customizable. 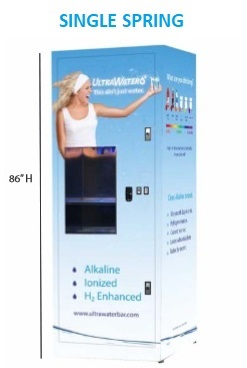 With our commercial water ionizers you will be able to offer your customers choices. Some people want reverse osmosis water while others want 8.5 pH ionized water and still others want 9.5 pH ionized water. You can get actually get all that in one piece of equipment. This commercial water ionizer equipment is designed to suit all of your customers, and at an unbelievably low price for what you get! If you plan to deliver the water on a self-serve, inside location, we suggest our Indoor Commercial Restaurant-Grade Water ionizers as the most economical option. With our restaurant-quality, indoor commercial-grade water ionizers you will not see anything above the counter but the spigot and small sink (as pictured). The height of the spigot is up to you. The rest will be tucked away inside a base cabinet (note cabinetry is not included). The water ionization and filtration parts are constructed in the US with water-cells that are made and certified in Japan. The water filtration systems are all BPA-free and are up to Water Quality Association standards. Unless you specify otherwise, the water will always come out at 9.5 pH and at least -300 ORP. The standards are scientific and exact. There are no variations! The water cells use a form of continuous-cleaning which will not allow them to degrade or lose ionization-power over time. Purchasing commercial water ionizer equipment is a bit different than buying a ready-made machine. 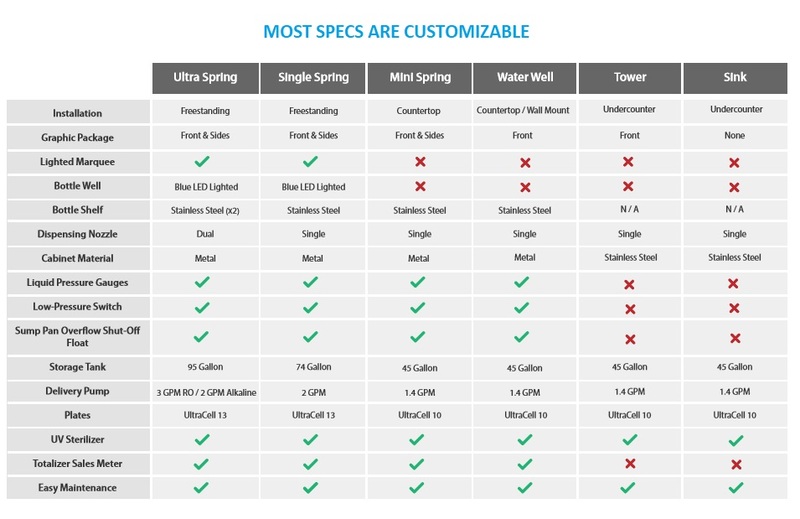 You can customize your commercial water ionizer system to the exact specs of what you want. On this page, we show you the most popular and common options for commercial water ionizers. However with commercial water ionizers we employ just about ANY customizations you want. For instance, if you wanted several spigots with different heights (rather than just one) that could be arranged; or another popular request is to install a flow-control knob, giving the customer more control over the speed of water-flow. These are just two of the many types of customizations our manufacturer can do. The manufacturer is very experienced in the needs of commercial enterprizes and is ready to give advice and answer your questions as part of the buying/customizing process. 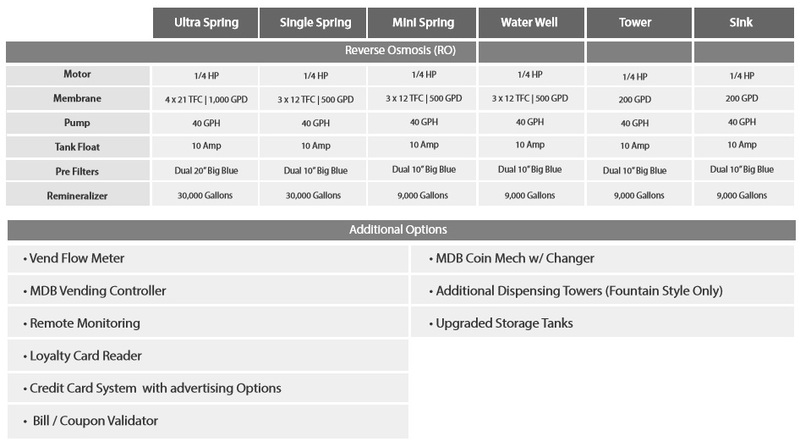 Note: All commercial water ionizers have very economical on-going costs (see replacement filter pricing, below). 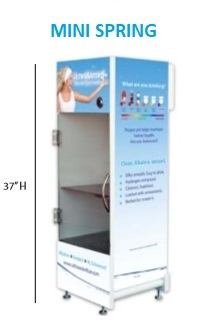 Summary: Indoor commercial indoor water ionizers are similar to the outside vending machines, pictured below. The basic equipment is the same, but because the cabinet and credit card processing equipment are not included they are far less expensive. They run about $7995.00 [shipping is extra]. 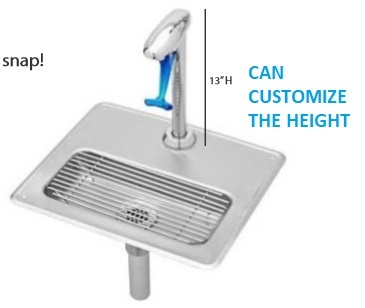 The basic equipment of our commercial water ionizers can normally fit under a 5 or 6-ft. counter (not included) with only the spigot showing on the countertop above. You can also put a vending-box commercial water ionizer inside without the credit card option (if that fits your needs better) and the cost of the credit card option you don't want would be removed from your price for that machine. Vending boxes, even without the credit card processors, are more expensive in initial costs, but there are many advantages to using a vending box over your own base cabinet: 1) It stands upright and uses a smaller footprint, 2) it is made of very durable metal, which will outlast most other cabinetry, 3) it's user-friendly and intuitive, and 4) familiarity & trust. The decision is really up to you and your needs; it is basically the same, high-quality equipment either way. You should be aware that your municipality may require NAMA certification for you to legally sell water through a vending machine or in a commercial capacity. Our commercial water ionizer vending machines are the only commercial water ionizers with NAMA certification, the official certification for vending machines. NAMA stands for National Automatic Merchandising Association. These commercial water ionizers are the only ones which have passed the rigorous inspections of NAMA. Perfect filtration using carbon filtration, reverse osmosis and then running the water through remineralizer filters to add back the proper minerals. No matter what your location, all water will be perfectly cleaned and remineralized to "PERFECT" standards as step #1. This water is healthy in and of itself, because it has been remineralized, and some customers may want to despense it without ionizing it. Although if they are educated in the benefits of ionized water they will probably want that. You could help to educate them, which would be great for them; their friends; and you in the long run! Step 2, Ionization: Your perfectly filtered water now goes through several water cells at an exactly measured, fast speed (about 1 1/2 gallons per minute) to ensure that every bottle or glass of pH Water comes out the same as every other bottle or glass of pH Water! The standards are scientific and exact. There are no variations, unless you want it (as stated earlier we can customize all of this equipment for you)! 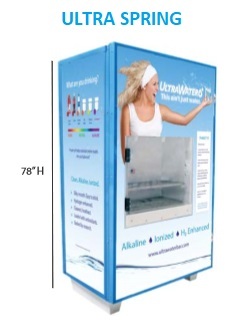 The cost of commercial double-vendor water machine is $16,995.00. It can be either installed inside or outside. Wherever installed, it will need access to a water supply, drain and electricity. The payment credit card processors need internet connectivity. The water pressure must be at least 75 psi. There also may be permits needed. The machines should be installed by a plumber or maintenance personnel who are knowledgeable about plumbing and installations. When you choose outside vending, there are a few things to check into: There may be license requirements, taxing requirements, etc., and if you lease your facility, the landlord should be consulted to ensure it is in compliance with all of their regulations. For instance, Pepsi may not allow another water vending machine to be placed in the same location. All commercial water ionizers come with a one-year warranty, and after that if parts wear out and need replacing, they are available at very reasonable prices. The easy training needed to replace any parts is given to you whenever you need it. Most parts replacements are literally a snap. If you plan to bottle ionized water, we don't recommend it. The bottling and storage processes destroy all beneficial antioxidants in the water. The ongoing upkeep and maintenance of all commercial water ionizers is the responsibility of the customer. Typically only the following filter-replacement is needed. Here are the standard parameters. All commercial water ionizers are customized to your specific needs and wants. The pricing for the different systems has been estimated here for you, but varies a little, depending on the costs involved in doing the customizations. Even with unlimited customizations, our experience is that the prices are usually very close. There is no other place to order commercial water ionizers with this level of customization and quality. Our commercial water ionizer equipment pricing is amazingly economical too. We ensure that the quality of parts, such as water cells, is the very best you can get. You can initiate the ordering process by emailing us. Please tell us as much about yourselves and what you hope to achieve with your commercial water ionizer purchase as you can. There are many details about our commercial water ionizers on this page that you can use to give us a good idea of what you want so our manufacturer can get a preliminary bid to you. The more information you give us about you and what you want; the faster the bidding process is. All commercial water ionizer systems must be fully contracted and purchased (paid in full by wire transfer) prior to construction. Cost of shipping and installation is the buyer's responsibility. Shipping is not charged until the equipment is made and ready to ship.